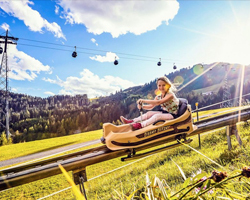 Brandauer GmbH, manufacturer of the Brandauer Mountain Coaster, has become part of Sunkidworld. Sunkid GmbH is a global provider of attractions such as lifts, amusement rides, and other family activities. Brandauer, founded in 1980, built and installed its first mountain coaster in 1996. The unique trademark of the Brandauer coaster is its monorail system, which offers unique ride dynamics and is also said to be cost-efficient. The coaster can be installed on any slope with at least a 5 to 7 percent grade. Its lightweight toboggan carts allow for a wide variety of uphill transportation options, including the use of existing resort infrastructure such as t-bars, chairlifts, and gondolas, to move the carts to the summit of each run. There are more than 40 Brandauer installations worldwide.